Some things just aren't meant to be done while walking or driving, and one of them is watching DVDs. Unfortunately, that message was lost on Eyetop.net, makers of the Eyetop Wearable DVD Player. This system consisted of a standard portable DVD player attached to a pair of heavy-duty shades that had a tiny 320-by-240-pixel LCD embedded in the right eyepiece. You were supposed to carry the DVD player and battery pack in an over-the shoulder sling, put on the eyeglasses, and then... squint. Or maybe wear a patch on your left eye as you walked and watched at the same time. Up close, the LCD was supposed to simulate a 14-inch screen. Unfortunately, the only thing the Eyetop stimulated was motion sickness. Maybe if they'd called it the Winesap instead of the Pippen... Nah. This game console was slower than a worm through a Granny Smith. 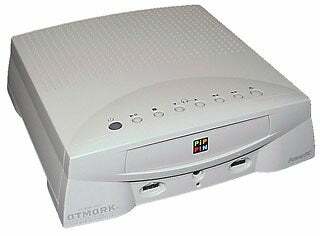 Before Xbox, before PlayStation, before DreamCast, there was Apple's Pippin. Wha-huh? That's right--Apple had an Internet-capable game console that connected to your TV. But it ran on a weak PowerPC processor and came with a puny 14.4-kbps modem, so it was stupendously slow offline and online. Then, too, it was based on the Mac OS, so almost no games were available for it. And it cost nearly $600--nearly twice as much as other, far more powerful game consoles. Underpowered, overpriced, and underutilized--that pretty much describes everything that came out of Apple in the mid-90s. In the late 90s, companies competed to dangle free PCs in front of you: All you had to do was sign up, and a PC would eventually show up at your door. But one way or another. there was always a catch: You had to sign up for a long-term ISP agreement, or tolerate an endless procession of Web ads, or surrender reams of personal information. Free-PC.com may have been the creepiest of them all. First you filled out an extensive questionnaire on your income, interests, racial and marital status, and more. Then you had to spend at least 10 hours a week on the PC and at least 1 hour surfing the Web using Free-PC's ISP. In return you got a low-end Compaq Presario with roughly a third of the screen covered in ads. And while you watched the PC (and the ads), Free-PC watched you--recording where you surfed, what software you used, and who knows what else. We can't say whether this would have led to some Big Brotherish nightmare, because within a year Free-PC.com merged with eMachines. By then, other vendors had similarly concluded that "free" computers just didn't pay. Few products literally stink, but this one did--or at least it would have, had it progressed beyond the prototype stage. In 2001, DigiScents unveiled the iSmell, a shark-fin-shaped gizmo that plugged into your PC's USB port and wafted appropriate scents as you surfed smell-enabled Web sites--say, perfume as you were browsing Chanel.com, or cheese doodles at Frito-Lay.com. But skeptical users turned up their noses at the idea, making the iSmell the ultimate in vaporware. Disorientation, discomfort, dysphoria: Sharp's notebook was first to market with 3D that hurts. As the first "autostereo" 3D notebook, Sharp's RD3D was supposed to display 3D images without requiring the use of funny glasses. But "auto-headache" was more like it, as the RD3D was painful to look at. When you pressed the button to enable 3D mode, the notebook's performance slowed, and the 3D effect was noticeable only within a very narrow angle--and if you moved your head, it disappeared. Maybe the funny glasses weren't so bad after all.